Given how well received the previous Chess960 Titled Arena was, we're bringing it back for round 2. As with last time, the control will be 2 minutes + 1 second increment to give everyone a chance to get used to the unfamiliar positions. The tournament duration will also be 3 hours, and thanks to the donation of last month's first place prize we have a bumped prize pool of $1500! 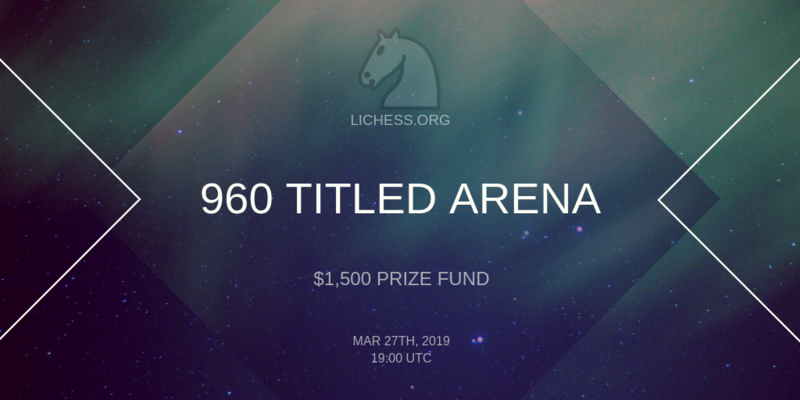 This event will also be preceded by a Chess960 Warm-up Arena, open to all players with a minimum of 10 rated Chess960 games. If you are new to Lichess, it's important to become familiar with the arena tournament format. Read our FAQ and consider trying out an arena tournament in advance. And if you're not familiar with the rules of Chess960, read this page. Arena points are awarded based on the number of games you win. If multiple players finish the tournament with the same number of points, tournament performance is used to break the tie. Prizes will be awarded within three days after the event, through PayPal, BTC or Euro wire transfer. We've had a bunch of players streaming the previous Titled Arenas, including Magnus Carlsen, John Bartholomew, Eric Rosen and ChessNetwork. We encourage both participants and fans to live-stream the tournament. If you plan to, check out our small streamer's kit for some useful graphics to include in your overlay. Good luck to all players in this brand new Titled Arena edition!